Years upon years of painstaking research and I’ve come to one inevitable, terrifying conclusion: a conclusion that will rock this world to its very foundations and undo all that we know, or even that which we think we know. It’s a force which I’m loathe to unleash upon this green Earth, knowing as I do that it will only lead to madness on a global scale, but as I have already been infected, I am compelled to pass it on to the next unsuspecting victim. Dear lord. What have I wrought? If you can get that damnable tune out of your head long enough to concentrate on the matter at hand, you can join me in this week’s installment of Gadgetbox. We’ve got a doorbell for ringtone fetishists, continued proof that you can add a USB hub to anything , and intelligence on the latest heavyweight to leap into the HD format fray. The bells are ringing; the song they’re singing is…up to you! Let’s face it: doorbell technology has been stagnant since the invention of the wireless battery-powered version. In fact, door technology really reached its apex in the mid-’80s on Silver Spoons . Since then, it’s been a tough time for doorbell manufacturers. Perhaps not all is lost, though. Think Geek is selling a $99 USB doorbell that lets you load up a WAV or MP3 file of your choice to sound whenever someone comes a knock-knock-knocking on heaven’s your apartment’s door. Connect it via a standard USB cable to your computer and upload an up to 30 second file, then connect it up to your already-installed doorbell system. What do a 4-port USB hub, a letter opener, and a clock have in common? If you guessed “three items that thirteenth-century Cistercian monks did not regularly use” you’re close—but it’s actually a trick question: the answer is nothing. They have nothing in common. Or at least they didn’t until some unheralded genius decided to combine the three into just one device. That’s right: it’s the 4-port USB hub letter opener clock. There is, unfortunately, not much else that I can tell you about this gadget to end all gadgets. It has one USB-in port, 4 USB-out ports, supports USB 2.0, and has alarm clock functionality, so you can wake up and get immediately to your sad, sad life of letter-opening. 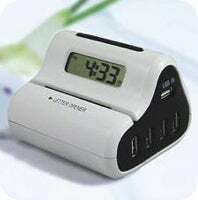 The 4-port USB hub letter opener clock (wouldn’t something like the “Time-Slicer” have been much catchier?) runs on 3 AA batteries which, and I don’t say this lightly, may be the first total waste of perfectly good AA batteries that I’ve ever encountered. In fact, I can’t even tell you how much this thing costs, but rest assured it is far, far too much. Really, I just feel bad for the makers of the standalone letter openers, clocks, and USB hubs who are sure to suffer from their consolidation into this new super gizmo. It’s been a while since we’ve delved deep into the still-raging format war. I know, I know—you’ve missed it with every fiber of your being . But the good fight is still being waged between the next-generation optical formats with little heed for the consumers civilians stuck in between the battling superpowers. This week, a sortie by Blu-Ray struck a deep blow to the HD-DVD camp, as it was announced that Blockbuster would be entering the conflict on the side of the Sony-backed forces. The video rental chain had been trying out both formats, but on Tuesday the giant said it was expanding its Blu-Ray offerings to 1,700 stores, each featuring 170 titles with more to come as they’re released. Oh gadget Gadgetbox…ba-dum-du— whoops, sorry. Crud. Maybe I’ll have it out of my head by next week. We can only hope. See you then.